Happy Monday!! 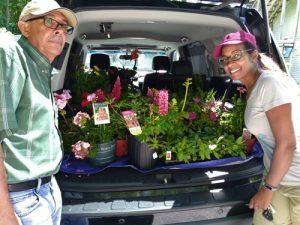 It’s that time of year – plant shopping!! Well it if you have been hanging out with me for long, you would know that I have an annual plant shopping that occurs between Mother’s and Father’s day. 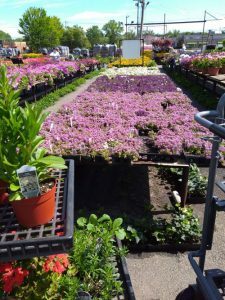 I always give my father-in-law a gift certificate to one of my favorite garden centers for Father’s day. We learned fast that we should go a few weeks before father’s day to find the best picks. So this past week, he and my Mother-in-law came with me for some shopping! The weather was a perfect 72 and sunny. We rolled off with our little carts to see what goodies we could find and I can tell you that we scored on some beauties. We bought so much that we had to put down one side of the middle row seating to accommodate them. 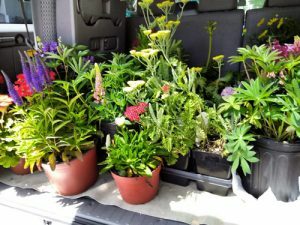 This year I bought a mixture of perennials and annuals. My goal is to buy more and more perennials and to eventually only need to buy a few annuals for quick pops of color. My FIL bought some salvia, yarrow, lupine and some other beauties. I snagged some zinnias and snapdragons which are my favorites and I bought some more bee balm to add to my others, fountain grass and many others. 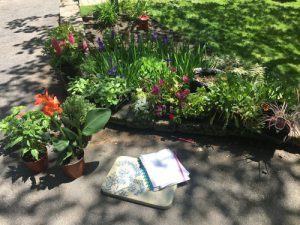 After my FIL left, I got right down to business and began planting and writing in my garden journal. I managed to plant about 70% of them before my allergies and back started talking. I saved the rest and finished up yesterday. 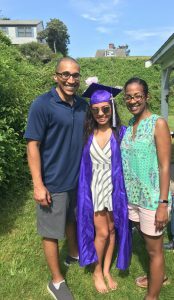 We spent Saturday on the Cape attending my niece’s high school graduation party. 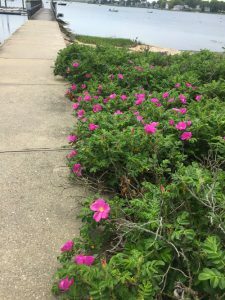 They rented a beautiful place on the waterfront and I walked near the water and remembered how much I used to love seeing this flowers along the beach when I was growing up. There were two large grassy areas for the kids to play and the food was quite yummy. 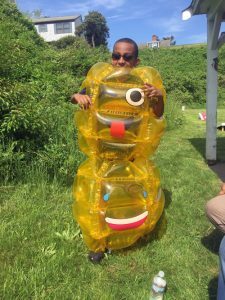 Apollo and my other nieces played in these funny inflatables. They would run and bounce off of each other. 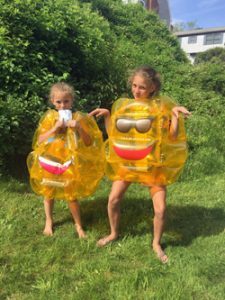 Some kids even went in the water at the beach but I don’t touch the water until July. It’s too cool for my taste. Overall a great week and weekend. My allergies are slowly subsiding and I am hopeful that I can spend more time outdoors. Today is a rainy day but instead of being grumpy about it, I am quite happy to have free water for my new and old plants. Hello Jan! I am so sorry I am just now responding to your comment from June!! I didn’t see it in my software and have been away from my blogging since mid-summer. I too love to see different parts of the world and especially love seeing plants. We ended up having a rather brutal summer with extreme heat and humidity. So my plants had to toughen up fast. I hope you had a wonderful summer and I would love to see your garden. Thank you for stopping by. I am officially back to work today and will be back to posting regularly. So I hope you will stop by again! Have a blessed day!